With its prestigious Park Lane address, the Four Seasons is the epitome of luxury. 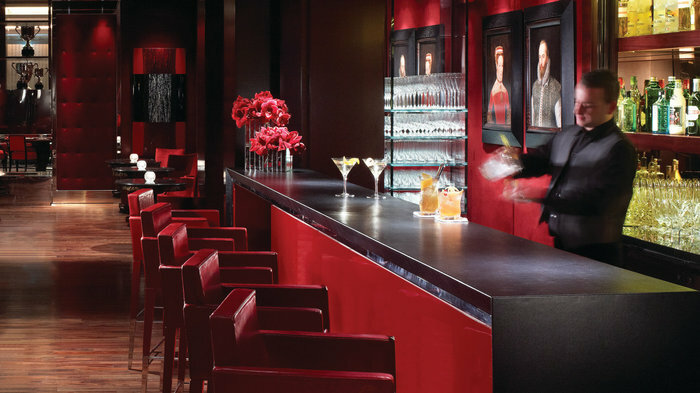 Although the group's first European property, a £12 million makeover in 2011 completely renewed the hotel with interiors by celebrated French designer Pierre-Yves Rochon. Overlooking Hyde Park, the Four Seasons has a prestigious Park Lane address. The Four Seasons London Park Lane reopened in January 2011 followed a stunning £12 million refurbishment. Interiors are the work of celebrated French designer Pierre-Yves Rochon, whose concept was implemented by ReardonSmith, the same team responsible for breathing new life into The Savoy. But the two hotels couldn't be more different. The decor here is a warm traditional mix of antique furnishings and modern comforts, rich in little luxuries. It's located just up the road from Buckingham Palace, with the pleasures of the West End on one side and the shops of Knightsbridge on the other, but with Amaranto, the hotel's restaurant, bar and lounge, and the spa perched on the rooftop with views over Hyde Park - literally its crowning glory - it's so comfortable you may be reluctant to go out. Amaranto restaurant, lounge and bar serves an Italian-inspired menu. A ruby red restaurant with marble floors within the Four Seasons Park Lane, Amaranto presents modern, Italian-inspired cuisine combining classical and traditional dishes reflective of the changing seasons. The restaurant, with interiors by celebrated French designer Pierre-Yves Rochon, part of a £125 million makeover lavished on the hotel in 2011, is three flexible spaces in one - the restaurant, bar and lounge - each with its own decor, so guests can choose where they want to sit without the restrictions of restaurant opening and closing times. A refined but eclectic selection of a la carte and daily changing menus are offered for breakfast, lunch, afternoon tea and dinner. A sample menu, to give you a flavour of what to expect, might include light and elegant dishes like octopus with puttanesca sauce and salsify, pasta with spicy seafood and artichokes, and turbot fillet wrapped in courgette and served with creamy spinach. Afternoon tea - awarded 'The Tea Guild special Award of Excellence in 2013 - is served in Amaranto Lounge every day between 3pm and 6pm when a selection of sandwiches, macarons, eclairs and tarlets is accompanied by a wide choice of bespoke, vintage and unique blends of tea specially selected for Amaranto. Few spas come with views like this. Few spas come with views like this. Situated on the 10th floor of the Four Seasons Park Lane Hotel, the luxury spa - which has been designed by The Organic Pharmacy - combines nine treatment rooms with dazzling panoramic views of the city through floor-to-ceiling windows. There's a massage for everyone at the Four Seasons, choose from Swedish, fitness, mineral stone or aromatherapy. If you want to try a more adventurous body treatment, opt for the green coffee and chilli resculpting massage, or seaweed and eucalyptus detoxifier. The spa is next to a state-of-the-art Fitness Centre so you can work out while overlooking Big Ben, the Houses of Parliament and the London Eye. But for the ultimate indulgence it's got to be the Sky Suite, an exclusive private room where you can enjoy signature treatments for two in a private area with a double steam shower, relaxation area and unbeatable views across London's parks and landmarks. From cheap budget places to stay to luxury 5 star suites see our special offers for hotels, including DoubleTree by Hilton London - Marble Arch from 39% off.